If you haven't a voice like Sinatra or Crosby; if you can't tickle the risibility of people as do Hope or Umbrioggo; if you can't dance like Arthur Murray, don't fret! You can still be the life of the party if you know a few simple card tricks ... tricks that are sure to baffle your friends and keep them entertained and guessing no end. The card tricks in this ebook are unusual and clever. All you need do is follow the instructions. You don't have to concern yourself with intricate sleight of hand maneuvers. You don't have to be born a magician. no special skill or previous practice is required. All you need is a standard deck of cards, preferably your fiends' cards, which lends enchantment to your performance because by using their cards, all suspicion of having your own prepared deck is removed. It is always a wise policy to learn and master one or two new tricks at a time. Go over them carefully so that each formula becomes part of you. Read the directions several times before attempting to do any trick. 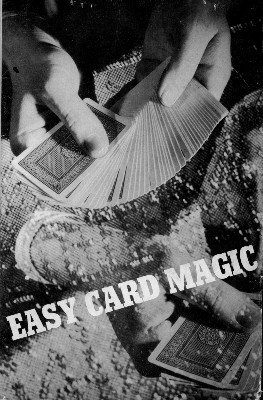 If you have thought the card trick over in your mind, and know precisely what to do, you can perform it with a certain professional ease that will give you as much of a thrill doing it as your friends who are watching it. Every trick has been thoroughly tested. They are all terrific and successful! Choose the ones you like best and do best. And under no circumstances should you reveal their secrets to anyone! 1st edition 1972, 1st digital edition 2016, 28 pages. Good and useful material. The price is a bargain. However the writing style is not very explicit, but manageable if you are not reading a magic book for the first time.